Hello everyone and a Happy New Year to you! It was quite a busy period during December and the New Year for missing clips and finding them, for me at least! In mid-December I was pleased to announce the discovery of a clip of Georgie Fame performing ‘The Ballad of Bonnie and Clyde’, originally broadcast 21/12/67, and sold to Austrian TV, broadcast in 1968 on a show called Go Go Scope. This was discovered by Keith Read who contributes to the Missing Episodes Forum. A number of e-mails were sent between myself, Keith Read and also Keith Badman, Britain foremost expert on rock and pop TV, who confirmed it was from Top of the Pops, with myself ascertaining the transmission date. The fact that this is safe in the Austrian TV archive is great news and hopefully the BBC will recover this soon. On Christmas Eve, collector Lance Meenach found a superb Jimi Hendrix Experience clip on YouTube from French TV archives. With a little research via a Hendrix website and other information sources, I was able to find out that the clip ( a performance of ‘Burning of the Midnight Lamp‘) was also shown on European TV as a result of international sales, and was originally broadcast by ATV on Good Evening, I’m Jonathan King (tx 14/10/1967) and had been wiped in the UK. Things didn’t stop there. The same morning, I found a YouTube clip from the last broadcast episode of Saturday Scene, a regional children’s TV show presented by Sally James and made by LWT. The clip, broadcast 03/09/77, showed Sally being wished well for the future by a variety of guests including Roger Taylor from Queen, members of Brotherhood of Man, Paul Nicholas and Marc Bolan. This was Marc’s penultimate appearance on TV: he would tragically die less than a fortnight later. Most Saturday Scenes are missing presumed wiped, including this one. I also am hoping to recover some footage from another children’s Saturday morning show, Southern TV’s Saturday Banana, which is also virtually missing as a series, and I have also located some Mersey Pirate from Granada TV. More recently I have located a partial edition of Celebrity Squares from 1976, also missing, and I have found an hour’s worth of footage from a missing ATV chat show from the late ’60s. On 5th January, many of us heard the news of the great Gerry Rafferty’s passing. 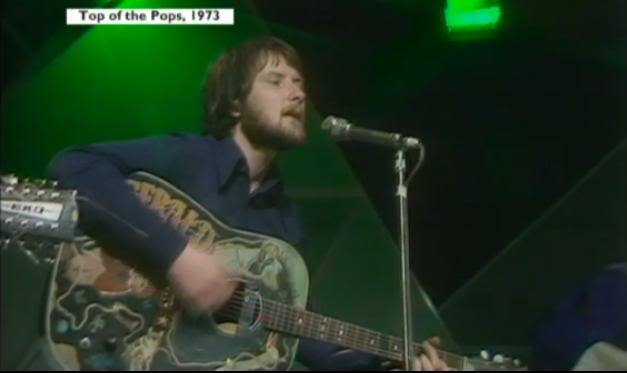 Naturally, there was a televisual obituary on BBC News, and as well as featuring ‘Baker Street’, there was a quick clip of ‘Stuck in the Middle with You’, which Gerry performed with his group Stealers Wheel on Top of the Pops in 1973. Eagle-eyed missing episodes hunter Laurence Piper spotted this was captioned “Top of the Pops, 1973”. Further research done by myself and others confirmed this was a clip thought to be missing, and it has been confirmed to be from TOTP tx 18/05/73. Let’s hope for more finds in 2011!